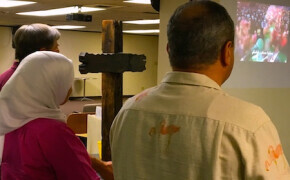 A group of refugees sat in a semi-circle facing a large wooden cross while balancing paper plates of chicken and potato salad on their laps as their children played tag in the carpeted expanse of an adjacent room. A few Muslim women wore the traditional hijabs covering their heads while others donned shorts and t-shirts more typically seen on a hot day in Dallas. These people came from all pockets of the globe, including many from the Middle East, Asia, and South America, to Gateway of Grace, a ministry for refugees. The men and women attending the Bible-study class read and discussed scriptures in English, Farsi and Arabic. This small gathering is part of a larger ministry that meets the refugees’ practical and emotional needs such as housing, education, and friendship. However, the Rev. Dr. Samira Izadi Page, who is an Episcopal priest and director of Gateway, wants to meet their spiritual needs, as well. Page is a former Muslim who fled Iran nearly 20 years ago with nothing but the clothes on her back, making her particularly authentic in leading refugees to Christ. Page’s efforts are somewhat counterculture to trends in the ancient heartlands of Christianity in Europe and North America. It is a struggle to engage a contemporary society where it is assumed Christianity is obsolete, said the Rev. Canon J. John, evangelist to the Archbishop of Canterbury. The Church, in the United Kingdom and in the U.S., is struggling with the pace of this change. “Within a generation Christianity has gone from being the unquestioned source of moral authority in our culture, to being a marginalized and frequently despised belief system,” he said. One of the best ways to share the good news of Christ is to allow people to belong to a group before they believe, said Alan Avera, senior executive for Christianity Explored ministry in North America. “In our day and age we can no longer assume that people really understand who we are talking about when we talk about God in the Bible. People have preconceptions of who God is, through all kinds of sources that may not be accurate. That means they haven’t rejected the true God, but their perception of God.” Allowing people to join a small group before believing allows them time to explore questions, build trust, decide things for themselves and most importantly let the Holy Spirit guide them towards conversion, Avera said. Sometimes ministries blend in beautiful ways to lead others to Jesus. For instance, Page asked Mendez to help with two refugee families from Cuba who struggled to with their new surroundings in North Texas. Mendez said he brought them groceries and began to talk to them about the Episcopal Church and Jesus. The families had not been exposed to Christianity and were very curious about Christian life, Mendez said. A year later, the families are active parishioners at Santa Natividad and six have been baptized. Speaking of prayer, a large movement of intercessory prayer is spreading throughout the diocese. The Harvest Intercessory Prayer Network is gathering momentum and gaining members as they meet, pray and train others in intercessory prayer. “It’s important in evangelism to pray for those who do not yet know the Lord, and for those in the mission field,” Headington said. If you are discerning God’s call to lead others to Christ, or if you would like an evangelist to come to your church to train parishioners on how to share their faith, contact Carrie Boren Headington at .